This summer, IonE was fortunate to host three undergraduate students – Roxana Ayala, Manisha Rattu, and Ramiro Pinedo Jr. – from the Doris Duke Conservation Scholars Program at the University of California, Santa Cruz, a two year conservation-leadership program that aims to combat the lack of diversity in the field of conservation. The UC Santa Cruz program, one of several programs across the country supported by the Doris Duke Charitable Foundation selects a class of 20 students from across the country each year, immerses them in the field and nurtures their leadership skills. Last summer, our three scholars – and the 17 others in their cohort – primarily did field work. This summer, all 20 had internships across the country, providing the scholars with professional experiences and exposure to some of the less outdoorsy aspects of conservation science and policy. 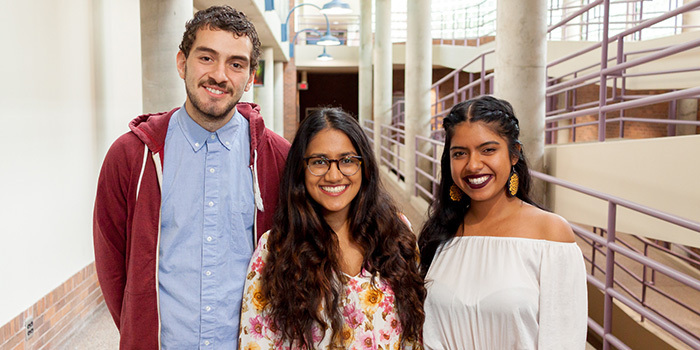 Roxana, Manisha, and Ramiro all grew up in California and each attend, respectively, The University of California, Irvine, Stanford University, and Pitzer College, during the school year. While in Minnesota this summer – the first time any of them had traveled to the Twin Cities or even the Midwest – the trio was embedded within IonE’s Natural Capital Project (NatCap). They worked on projects ranging from analyzing the vulnerability of mobile homes to flooding nationwide or neighborhoods in Minneapolis to extreme heat, to creating story maps illustrating the impacts of rainfall in Boa Vista, Brazil, that help viewers understand the value of nature to different communities across scale and contexts. We sat down with the three scholars from California to ask a few questions about their summer at IonE. What was your primary project this summer? Roxana: This summer I have been interning with the Natural Capital Project. For the most part I worked on a project focused on analyzing manufactured homes across the United States. Using the system geographic information system (GIS), I have been able to use spatial analysis to measure the number of manufactured homes that are located in flood zones and assessing if any environmental hazards are in close proximity to manufactured homes. Manisha: I spent my summer dabbling in a few different areas of research: I assisted on a literature review of Urban Heat Island (UHI) modeling tools to supplement NatCap’s future UHI work; I helped a NatCap researcher with a section on the UHI effect and issues related to equity for a large synthesis paper; and I focused my current efforts on creating a neighborhood-based analysis of Minneapolis demographics, UHI and temp, as well as urban tree canopy cover. This analysis reveals which communities are being impacted the hardest by the UHI effect and helps create a prioritization metric that could possibly be used by the Minneapolis Park and Recreation Board on their 20 Year Neighborhood Park Plan, as well as future projects for NatCap. Ramiro: This summer, I primarily focused my time in creating a story map that would shed some light on the effects rain has had on the capital city of Roraima in Brazil as it has become increasingly populated and urbanized. I had studied abroad there before the start of the summer, and I really wanted to work on a project that would allow me to read more about this particular region (in Portuguese) and also help me formulate further research ideas for my senior thesis, a Fulbright application to work and study in Brazil, graduate school and beyond. What was your favorite part of working at IonE this summer? Roxana: One of my favorite experiences interning at the Institute on the Environment has been working with the incredible staff. The staff that I have had the opportunity to work with have been supportive of my work and have taught me useful research and technical skills that I will be applying for the following academic year. Manisha: All the friendly faces around. It was great getting to know the NatCap team, but also wonderful to have the space to step out of the office and into the atrium and have the opportunity to meet more amazing individuals. IonE is a super cool space, full of remarkable people, and it is always refreshing to be surrounded by great leaders and thinkers. Ramiro: My favorite part of working at IonE this summer is being able to meet and interact with a spectrum of professionals all of whom have a drive to save the environment. It was interesting for me to learn about career paths that some IonE staff have taken to get to where they are now and to reflect on my own aspirations. What surprised you? Did you learn anything that you didn’t know before? Roxana: As a California native, this was my first time visiting Minnesota. Exploring the Twin Cities and interacting with many people have taught me so many new things about city functions and different cultures. I have appreciated having the opportunity to live in a different state because it made me a more resilient, conscious person. Manisha: This summer was a whirlwind of learning. As someone who lives in the Bay Area and goes to school there, I’ve never been far from home or away from California for long. From taking the bus every morning, to walking to the store to get groceries, to living and working with the same two people, to learning how to use GIS, to delving into new cooking recipes, to reading new books – everyday was full of lessons. My biggest surprise, however, has been the realization that so much of conservation work takes place at the desk, on a computer. This honestly surprised me a lot, and I am still unsure how this realization will affect my future plans. Regardless, the learning and growing continues. Ramiro: I was surprised with how much time is spent saving the planet being indoors rather than outdoors. I had expected more field-work experience from this summer’s internship. However, I did learn some GIS skills and how to use maps to portray messages. Roxana: I look forward to getting back into the flow of classes and research, and enjoying my last year of college! Manisha: This fall, I will be studying abroad through the Stanford Australia overseas program, and I am super stoked to hug a koala and research mangrove recruitment! The program is unique in that our group will move every two weeks to a different research station, so I’ll get to see most of the Eastern seaboard. From Cairns, to Brisbane, to Heron Island, to Queensland and more! Afterwards, my friends and I will be driving through Southern New Zealand to check out the glaciers and beautiful parks. Ramiro: I am very excited to return to my college, where I will be a third-time resident assistant, and have a new load of interesting courses for the semester. In addition, I’m looking forward to applying for fellowships, research opportunities and employment positions while enjoying my last year of my undergraduate studies. Why do you, personally, care about the environment? Roxana: The world we have is not ours to claim; in our lifetime, we are borrowing it and as we move on we shall then pass it to all the species that come after us. Therefore, I believe that it is our duty to preserve, to maintain and to uphold the utmost respect for mother Earth. Manisha: I grew up in a small town on the San Francisco Bay Delta called Pittsburg. Pittsburg is home to many industries and refineries, and I never questioned why until I was in high school and our city council proposed a crude-oil terminal. For two years, I was immersed in grassroots activism to forestall the terminal. As a 16-year-old, I realized the weight of our actions as humans and questioned why low income communities of color often paid the price. I was upset and became immersed in environmental justice efforts, from rallies in SF to community-based air monitoring; I made protecting the environment my passion. When I came to college, however, I realized I had spent a few years protecting the environment, but I had never gone camping or hiking. How could I care so much about an environment that I knew so little about and that I did not feel comfortable visiting? And when I became a Doris Duke Conservation Scholar and spent an entire summer outdoors, I realized that communities of color have always had ancestral ties to the land and institutions have forced us to forget about those ties. I care about the environment because it has always looked after my ancestors and me, and I cannot let other humans or myself hurt it more. Ramiro: For me, to care about the environment is to care about life itself. The environment provides so much. I’m able to breathe clean air, drink clean water, eat food, be sheltered, be clothed, play, expand my curiosity and much more because of the environment. It is truly everything to me, and I can’t bear to watch it be destroyed. Julie Berger is a summer communications associate at the Institute on the Environment.